Magento provides the basic foundation to the online traders to build and develop their own ecommerce sites. Magento is an open source technology that takes care of the shopping cart function, design of the product’s listings, the entire content and the complete online transaction, as a whole. The string search engine optimization, as well as management of the marketing operations, are governed by Magento. Security is and will remain the top most concern for all online product and service providers. Magento-powered stores are no exception to this security concern that companies and individuals have. In the recent years, the number of hacking attempts might seem to be less; but the impacts and criticality of these attempts are far more intense than what they were previously. Personal Information: Steal customers’ personal information for fraudulent activities like fake financial transactions, smuggling, etc. Commercial Information: Disclose a company’s marketing strategy and future campaigns which can cause considerable losses. While it is good to know why the hackers are after your data, it is really not important. The important part is to incorporate security strategies and be aware of the methodologies that the hackers have been using. 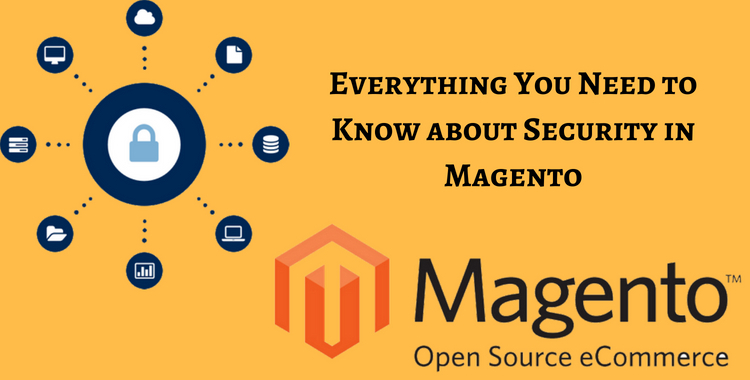 As a Magento store owner, it is your responsibility to safeguard the information that the users are sharing with you on your website. Let’s analyze some security concerns on Magento. Magento veterans believe that there are some core areas that make your store vulnerable and it is important that you take care of these areas successfully by customizing the features via the expert developers. Here, we will discuss the ways through which your Magento store can be hacked and also the ways through which you can secure your store. Injections: Hackers are always looking for ways through which they can acquire information from your site and one of the most common strategies is to use SQL injections, file injections, etc.to modify the codes. A developer can easily locate such breaches; but, then you have to be looking for these and it is not possible to be keeping an eye on such issues always. The injections can be shared via URL, cookies, etc. and it is important to eliminate such changes. Scripting: Cross-site scripting is another popular hacking technique for Magento. The hackers plant codes in forms that are submitted via the website. The codes are not visible on backend but if you will look at the codes, you will be able to spot them. The sure shot way of handling such attempts is to enable only http for cookies; this would prevent cookies from being stolen and misused by unauthorized individuals. Object Reference and URL Management: One of the most important aspect that ace Magento developers should keep in mind is to develop a store from security point of view and keep simple things in mind. First, is to take care if insecure direct object references and generate xml file with different parameters to avoid theft of admin details. Additionally, developers should avoid using obvious reference for URLs which makes it easy for hackers to decode and steal information. It is advisable to always go for the latest Magento version. With every upgraded version the issues of the older versions are fixed. Before finalizing the Magento version go for a testing demo before implementation. It is easy to crack passwords these days. Hence a two way authentication is necessary provided by the extensions. For example, Rublon provides a two factor authentication which enables only trusted sources to access Magento with the help of a smartphone. The Magento admin access is quite easy to get in to but one can prevent hackers with a customized term and then changing the admin path. While logging in to a site, especially via unencrypted connectivity there is a high risk of the data being intercepted, which means hackers will have easy access to the login credentials. Hence a secured connectivity is mandatory which Magento offers. One can avail secured HTTPS/SSL URL from the config menu. The Magento websites are compliant with PCI security standards and norms thus securing each and every online transaction. Secure the passwords by using SFTP or Secured File Transfer Protocol which makes use of a private key filing method for decryption or to authenticate any user while logging in. It is necessary to have backup plans for Magento security with hourly offsite backups as well as downloadable backups. This would ensure seamless continuity of your services even when the hacking operation has occurred. You can store the website back up files offline or get an online back-up provider to prevent data loss. Yet another security tip is to disable the directory indexing which will hide the different pathways with the help of which the files of the domain are saved. This is a primary check to prevent cyber attacks to reach out to the crucial Magneto linked files. It is always advisable to select your passwords carefully. It should be a mix of numbers, upper case as well as lower case alphabets and words along with special characters. Also, it is of utmost importance that you do not use your Magento passwords anywhere else. If you have locked out or forgotten your passwords, the Magento passwords can be revived with pre-configured email addresses. Note here, if the email address becomes vulnerable then the entire Magento setup is on a toss! In that case, it is advisable to use a separate and singleton email address to use in Magento which is not public and is secured with a two factor protection. The Managed Magento hosting platforms are probably the best hosting plan. It provides utmost security with frequent patches at the basic server levels. It is also important to keep your Magento versions up-to-date and follow industry best practices. Along with these things, a good awareness of what’s happening around will help you create strategies and take the right measures that would keep your store and user information protected. While nothing guarantees absolute security from hackers in online world, doing the best you can certainly prevent attempts or at least lower the impact of breaches if it ever happens. Learning from your mistakes is what works and sharing your experiences will certainly help developers come out with better security techniques which will help everyone. E-commerce specialist. With my curiosity, I am always ready to learn something new and find it useful for me and others. I`m a big believer because everything is possible for those who want to achieve a goal.